The next session for the BIG SING! Bantry group will be held this coming Saturday 21st November 3-5pm in the Christian Fellowship Hall. It will be a SPECIAL session…not only as you will learn some more alternative and unusual songs to add to your Xmas selection, but also because all the proceeds will be getting donated to support refugees in Lesvos, Greece. 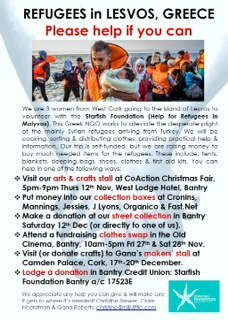 Monies raised will be used to buy provisions and sent across with three Bantry women. For anyone who would like to join us we will be taking the songs out and sing them around Bantry locations to raise further money following the session. 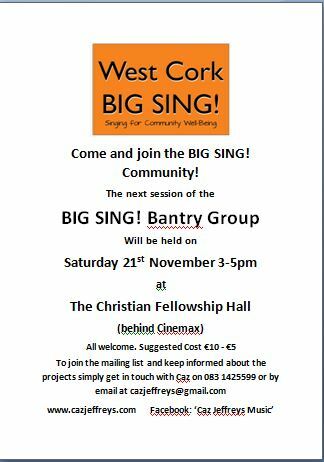 Next Bantry Singing session with West Cork BIG SING! The next singing session will take place on Saturday 21st November from 3-5pm in the Christian Fellowship Hall. Alongside learning the new set of West Cork BIG SING! songs, we will be singing some Christmas songs….a little different from the more usual collection, including Gospel and Ukranian folk. All are welcome to come along and join us and no experience is necessary.We sing because it makes us feel good! !